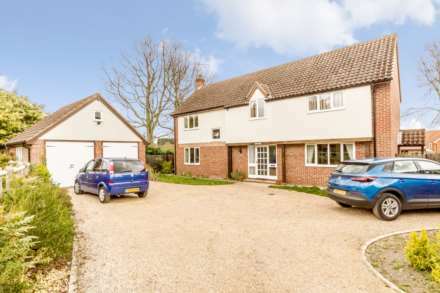 Situated within the Norfolk village of Holme Hale, Longsons are delighted to bring to the market this converted Wesleyan chapel, originally built in 1898 and later converted in the 1970`s to offer domestic dwelling. This character property offers accommodation in the form of a living area with living room and open pitched ceiling showing original ornate woodwork, garden room with sun balcony to bedroom above, two bedrooms, parking for several vehicles, garage and low maintenance gardens. 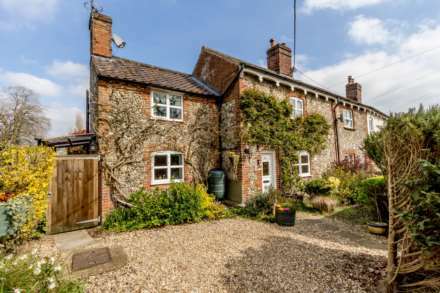 Simply oozing character the property offers potential as a fantastic holiday home or a two bedroom dwelling with open countryside views to the rear. Property offered for sale - CHAIN FREE! Entrance door to front, UPVC double glazed windows to either side, wooden parquet flooring, double doors with iron work and iron handle opening to living area. High pitched ceilings with exposed ornate timber work, stairs to first floor, triple aspect glazing with UPVC double glazed windows to front and both sides, two electric storage heaters. Fitted kitchen units to wall and floor, work service over, enamel sink unit with mixer tap and drainer, UPVC double glazed window to side, wall mounted electric heater. UPVC double glazed windows to rear and side, UPVC double glazed door opening to rear garden, electric storage heater. UPVC double glazed French doors opening to balcony with views across open countryside, electric storage heater. Walk in sit down shower cubicle with shower curtain, wash basin, WC, electric wall mounted towel rail, obscure UPVC double glazed window to rear, built in cupboard storing hot water cylinder. Main up and over door to front, personal door to side, obscure glass UPVC double glazed window to side, electric lights. Accessed by wrought iron gate with steps up to garden, laid to low maintenance shingle, paved path up to front door, driveway to garage door with parking for approximately four vehicles, access to rear garden. Low maintenance rear garden laid to patio slabs, seating area to rear and side, wooden fence to perimeter.